Andy Warhol (August 6, 1928 – February 22, 1987) was an American artist, producer and director and was the leading artist to influence the ‘Visual Art Movement’ known as pop-art. Many artists have been influenced by Warhol’s unique style of art and I can understand why; he uses vivid colours and bold lines to bring his work to life, though not all of his work is in a similar style. While some are created with simple line to give the basic shape of his characters, then it is added with several shades of block colour to make the line stand out, but I have noticed he also uses photography to help create his work. On some of his artwork, you can see he uses a method called ‘silkscreen’ — a method that involves printing ink through a stencils that are supported by porous fabric mesh stretched across a frame called a screen. This type of printing is better for bold, graphic designs, which is how he uses it when doing his Michael Jackson, Mick Jagger and John Lennon work. Silkscreen is something I would love to try out as it is a new form of printing I have not yet experienced, but it seems pretty timely and I doubt college have the resources to do something of this scale. Maybe I can find another technique similar to this one which will give the same results — though that seems unlikely as this is very one of a kind. This was quite eye-catching when I came across it as you can see Andy Warhol exaggerates the model’s make-up. 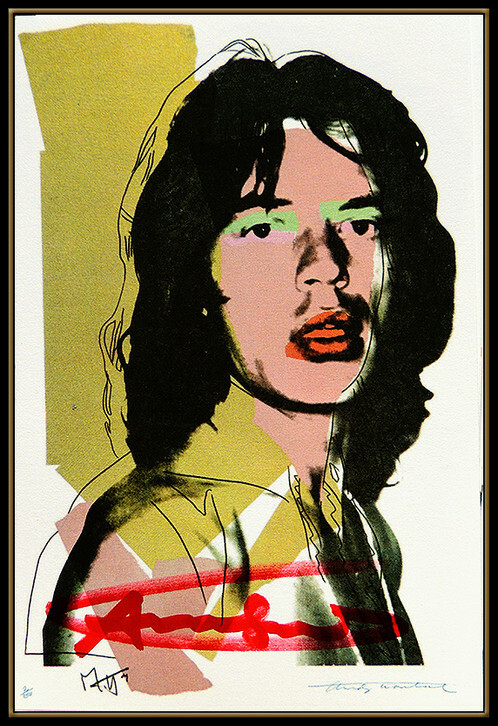 It is very unique compared to his other work (that is neat and follows the shape of his celebrity inspirations)– this one almost makes his model seem terriying as her red painted lips are tilted up into an unnerving smirk. It does give me inspiration for the look of some of my characters: when I draw John Lennon, I could vandalise his exterior by decorating his face in make-up, giving him an apperance of a drag queen or a woman. Why I would do this is because of John Lennon’s treatment of women (he used to physically abuse his first wife Cynthia Powell and demean her — though later in life he came to respect women and support women’s rights due to his second wife Yoko Ono) and make him become the person he hates.